This great tasting family casserole is a meal in one dish. 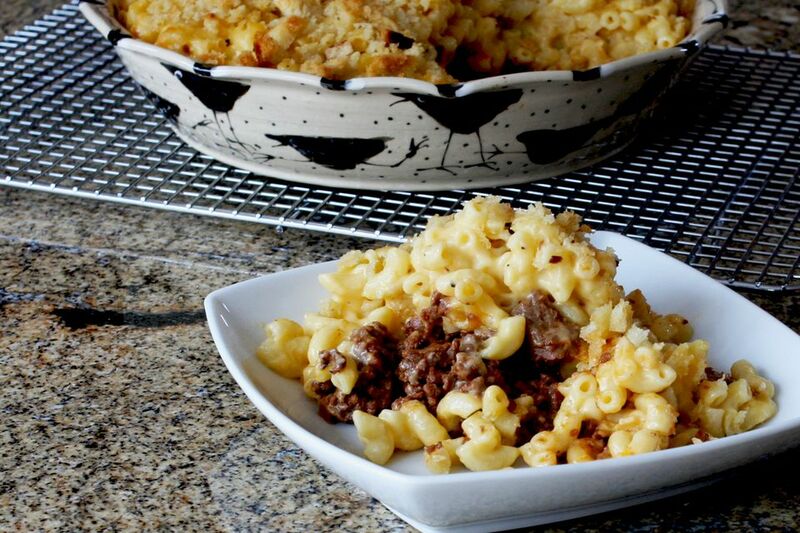 The "sloppy" part of this macaroni and cheese recipe is tasty sloppy Joe—a ground beef layer is followed by a creamy and rich homemade macaroni and cheese layer, then topped with bread crumbs and baked to perfection. This casserole will likely be a hit for kids and adults alike! In a large skillet over medium heat, heat the vegetable oil. Add the ground beef and onions and cook, stirring, until the beef is no longer pink and the onions are lightly browned. Pour off excess grease. In a small bowl or cup, combine the garlic powder, prepared mustard, ketchup, and brown sugar. Stir into the ground beef mixture. Taste and add salt and pepper, as needed. Set aside. Cook the macaroni following package directions. Drain in a colander and rinse with hot water. In a saucepan over medium heat, melt 2 tablespoons of butter. Stir in the flour and cook, stirring, for 1 minute. Add 1/4 teaspoon dry mustard and 1/4 teaspoon freshly ground black pepper. Cook, stirring, for 2 minutes. Add the milk and cook, stirring, until thickened. Stir in the shredded cheese and add salt, to taste. Combine the drained macaroni with the cheese sauce. Spoon the ground beef mixture into a lightly greased 2 to 2 1/2-quart baking dish. Top with the macaroni and cheese mixture. Melt the remaining 2 tablespoons of butter. Combine the bread crumbs with 2 tablespoons melted butter, mixing well to coat all of the crumbs. Sprinkle the crumbs over the macaroni and cheese layer. Bake for 25 to 35 minutes, until hot and the topping is lightly browned.